Western writers are some of the most undervalued writers in the world. Their books sell to millions of readers, their styles are honed, their stories are filled with nourishing history, dramatic climaxes and all the action of the Old West– and then there’s Mike Hundley– a writer in his own class, with a Western that stands above all competition. A writer who feels the Old West and makes his stories as refreshing as a drop of sweet Texan rain. 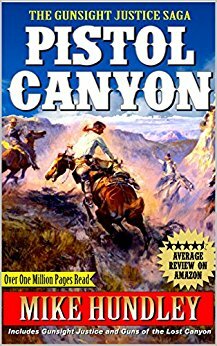 “Pistol Canyon” includes his acclaimed first book, a book that is sure to win awards, and sure to win a place on your bookshelf. Readers across America right now are enjoying the writing of Hundley. They are riding along with him. Have you joined their happy throng? Are you ready to sign up for the read of your life? Which Westerns have most influenced your life? I would say it’s bits and pieces of many mostly old TV shows and movies. In my childhood, it was black and white TV at the country store a mile away. We had no electricity in our farmhouse for a few years. I think The Lone Ranger and Silver got in every young boy’s head in those days. He was my first superhero, a symbol of good in the West. I loved Marilyn Monroe in River of No Return. Her beauty stunned us. I couldn’t wait to see the next episode of Lonesome Dove and the strong parts played by Robert Duval and Tommy Lee Jones. The one liners like when Captain Woodrow Call beat the hell out of the rude man with a branding iron and then proclaimed, “I can’t tolerate rudeness in a man.” I like most Westerns if they have a real story. Not all shoot ’em ups are good watching or reading. I think Westerns ought to honor our history and present a meaningful story about very real people. They ought to have that bigger than life epic feel, like the West is bigger than life. I hope my books will be seen as an epic story about real people who just happen to live in those hard times in the Old West, with some romance bound to happen. How did you research your Western? I asked my brother, Ran Hundley, who wrote “Blind Legacy,” questions about the War Between the States, timeframes and weaponry, etc. My buddy, Jim Haynes, answered my questions of horses and riding. I used the heck out of Google and Wikipedia. I have hunted in the mountains and canyons of the West many times. And I know some stuff! Like the movie “The Revenant,” I tried to capture the feel of the Rockies. I hope you will call me promptly Alejandro. We can work on this together. Tell us about the series. What is the overall story of the series? The Confederate Garrison family moved from Virginia after Lee surrendered; it was too painful to stay after their loss of the war. They headed to California, hoping to claim land under the Homestead Act, but the beauty of the Rockies stopped them in southwest Colorado. Over the next two decades, despite family death and many challenges, the Garrisons built a big cattle ranch with constant fights against warring Indian tribes, encroaching railroads, injustices and bullies. The Garrison sons become warriors, and Gabe, the eldest, found the truest love while running for his life. It goes on from there—timeframe 1865-1885. And then on into the sequel– maybe. Do you prefer writing about the heroes or the villains? I get a feeling of anger and disgust writing the villain’s part. It’s why they turn out to be so bad. And writing about good people takes me back to how I was raised on a tobacco farm in Southside, Virginia. My mama and daddy brought us up to be humble, kind and respectful. I think it’s how I have always lived. I get a swollen heart writing with passion about goodness, love or grief. I am unafraid to feel or show it, and I think the reader will also feel it. A good villain is hard to write. How did you approach writing your villains? Like the whole book, they just came out of my heart and then my fingers. The bad things they did just seemed naturally to happen in the heat of the moment. Once maybe good men, they worked themselves into becoming evil. And I had to give the Garrisons someone worth shooting at. What real-life inspirations did you draw from your book? Are any of your character’s people you know? I think to do good in the face of evil is the inspiration, to be patriotic and fearless when bad-thinking people try to do you or your family or your country any harm, fight back, make them pay. Ransom Garrison is a lot like my little brother, Ransom—tough and hot blooded. I’m a good shot and think boldly like Gabe but can only wish I was as tough and courageous. Lee Garrett is a bit like I was—a volunteer soldier in the Confederacy or Vietnam; our country needed us and we stepped forth, but thankfully I never lived his war experiences. May is like my mother, May—brave and beautiful. Without her many sacrifices, neither I nor Ran would have had much of a life. Where do you think the Western is heading? Is it dying or growing? I sometimes feel like a dinosaur in America now. Many people live like nothing I know, heads stuck in the sand politically, faces buried in social media. I love the Old America I once knew. Schools don’t teach history like when I was a youngster. There is so much competition in entertainment today and not as many readers out there. I hope Westerns find their way into more homes, a new age of enlightenment—wouldn’t that be something? Western history is the true story of America growing. Fiction embracing history enhances it. I think people will always embrace and love the adventure of that Western migration, the unforgiving journey of our forefathers, I hope so, anyway. We need more really good Western books to be written to keep that alive. And epic Western movies and high quality TV shows would really help. The audience is there. It would explode in size. That’s my 2 cents. What was the hardest part of writing the first book? I think finding the courage to start was the hardest, and that came from a good friend, Galen Pederson, who after reading my lengthy emails and messages to friends over the years, said on a visit last year, “Mike, you need to write something. You have a way with words.” So I came home and began, and couldn’t stop my fingers. You’ve got to start, then find excitement in the writing to finish, I think. That’s how it happened for me, chapter after chapter. I will always be thankful to Galen. He saw the writer in me and called me out. Can you see your series turned into a TV series or movie? It would be the fulfilment and validation of my life to see this on a screen. I think it’s written to fit a TV series over several weeks. Parts of it might make a grand movie, epic, a saga like the old Westerns. I guess it would have been easier and more realistic years ago to dream this big. But I have always dreamed big; no reason to stop now that I can see. Dream it, believe it, do it. Big dreams are free. Did you learn anything from writing this book and what was it? I found it to be a wonderfully amazing adventure just like I was living it real time—sad when the characters were sad. I felt all their moods. I think feelings were the driver, and the book is written from an array of feelings I had as I was writing, like watching a movie out of body. I seemed to have little control of the characters. I set them out into a scene, and they acted and I just took notes. A romance bloomed as I watched. I never expected it in all that blood, but it would not be denied. In my years, I never felt anything like it before. I like the feelings of living in that era of American history and hope to do it again soon. It was crazy wonderful. I hope it will grab onto the readers and have them feeling the same way. They will smell the sweat of the horses. I don’t feel this is your typical Western in some ways. Readers can decide. The ending is surprising to many readers, and I never saw it coming. I am not to blame. First, I hope all the readers will feel the thrill of adventure, wild and unabated, as they read it. I think the message is to understand in the world there is good and evil. Understand the difference, fight the evil and defend the good. Love the good people you know while they are alive, and avoid the bad ones. And hold on tight. Life moves on. Learn to shoot straight like Gabe. Be a good Arch Angel—it’s inside you. Embrace goodness! Repay the good in the world. Help others. I’m working on a sequel, hoping to build a series. It’s a way off but working toward that. Time is compressed. Inspiration fleeting. NASCAR driver, pro bass fisherman, pro golfer—I mean, if I could break 80! Or a superhero who could save America from itself. That would be the best job in the world, and I would have plenty of work to do. Lots of job security, too! Where can readers reach you to send ideas for your books? I have a Facebook page, and they can contact me there. It is the title of the book: “Gunsight Justice.” And to close, let me say many thanks to all who read my book and support me. It’s the thrill of my life when someone really enjoys the words I put on paper. Contact me, and by all means, if you loved “Gunsight Justice”, please leave a nice review on Amazon and on Goodreads.com. Thank you, Nick Wale, for promoting me, and thanks to all my friends old and new. After the Civil War, Will Garrison takes his family west. Together they build a ranch and battle powerful Indian tribes who have hunted the lands for centuries. A peace feather is offered after a climactic battle. With the Indian tribes and the Garrisons now walking a path of peace, a new threat has emerged… the railroad. Greedy government-backed killers plan to annihilate everyone and claim the land they need to expand their rail lines north across Colorado and into Utah. Their vile, sinister plan is revealed after many fights. Will Garrison’s son, Gabe, fights back and unleashes his pent-up vengeance against the railroad and kills one of their hired mercenaries. A destined meeting of chance leaves him rescuing a bloodied woman and falling hopelessly in love with the dark beauty. May is a brave woman who fights to guard a secret of her own. Together they flee to ancient trails, and as paid assassins track them, it becomes a long vengeance trail of dead men. When May reveals her deadly secret, Gabe finds himself at war with the railroad, an evil killer, and with everything he ever knew. He knows it’s time for GUNSIGHT JUSTICE! This is the action-packed Western that will remind you that freedom is something you must always fight for. Good battles evil as epic conflicts become climatic love scenes, and you find yourself breathlessly riding a trail of danger, deceit and passion with Mike Hundley in this Western that leaves no bullet unfired, no emotion untouched, and no reader left behind. In 1886 Colorado rancher, Will Garrison gets a big bill. He owes years of taxes on his 100,000-acre Ranch, but he’s dead broke. Garrison sets up to mine silver on his ranch, it’s at 10,000 feet elevation and winter is setting in. As silver ore is blasted from a stone bluff a gang of gunmen close in and set up camp just miles from the mine. The leader known only as “Barrister” is determined to steal the mine and kill all of the Garrisons. Evil deeds and bloody trails lead the Garrison sons to ride to Barrister’s hideout in The Lost Canyon. Gun battles leave the grounds strewn with bullet ridden corpses. Barrister hatches a deadly plan to divide the Garrison brothers and steal the mine. The plan works until Gabe and Ransom find the courage to take the fight deep into the canyon where a dozen gunmen await them. They have a bigger fight, to rescue a Doctor who can save one of their men critically injured at the “Devils Throat,” a gorge near the mine. Barrister’s gunfighter brother shows off his silver pistol with hand carved notches in the grip. He challenges the brothers to fight or die, or to find peace or die. The depths of the dark canyon protect many secrets which the brothers and a new ally discover. The end comes as enemies, old and new shoot to kill all the Garrisons in a fight to the death. The new ally has a secret plan which opposes his friend, Gabe Garrison. The last fight determines who claims revenge on a mutually hated enemy, Barrister. Download your copy of these two great books today!